NGC7000 in Cygnus is difficult to observe. It is not bright enough to be visible to the unaided eye and is far too big for a telescope. Photography is the only answer. This photograph, I believe, was taken with a 200mm lens and was about a thirty minute exposure. 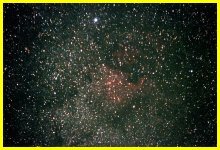 It shows, apart from the very obvious reason why NGC7000 is known as the North American Nebula, just how thick with stars is the Milky Way. The less bright patch of nebulosity above 'Canada' is IC5070, the Pelican Nebula, then fainter still above and right IC5068. The bright star at the top of the picture is Deneb. What looks like scratches on this photograph is not some esoteric cosmic phenomena but very ordinary household dust. The negative was in very poor condition when I retrieved and scanned it.